The Royal Suite. 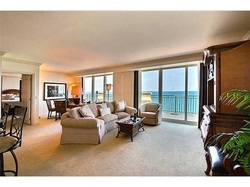 Fully furnished 1,200 SF corner unit with exceptional ocean views from every angle of the unit. Large living area, full kitchen, over-sized master bedroom and luxury Jacuzzi overlooking the ocean. This is one of the largest balconies in the entire building. Full service hotel offers 5 star amenities including room service, spa, oceanfront pool, high end beachfront restaurant and bar. Vallet parking, concierge and maid service is available as well. Located in the heart of Fort Lauderdale Beach easy access to dowwntown and nearby restaurants and bars in walking distance.